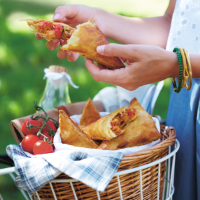 Make larger parcels to feed four hungry guests, or cook up a batch of smaller ones to serve as part of a spead. 1. Preheat the ovan to 200C, gas mark 6. Heat the oil in a large pan and add the onion and garlic. Cook over a low heat for 3 minutes until softened. Increase the heat to medium, add the chopped pepper and cook for a further 3-4 minutes until tender and browned. Add the courgettes and tomatoes and cook for another couple of minutes then add the chickpeas and heat through for 1-2 minutes. Finally, stir in the tahini and some seasoning, remove from the heaqt and leave to cool. 2. Cut each sheet of pastry in half from corner to make 4 large triangles in total. Pile the vegetable mixture on one side and brush the edges with a little of the beaten egg. Fold over the pastry to cover the filling and pinch the edges to seal. Transfer the pasties to a baking sheet and brush with a beaten egg. 3. Cook for 25-30 minutes until the pastry is golden and cooked through. Serve warm or cold with a green salad. To make smaller pasties, cut each pastry sheet into 4 triangles, then fill and seal as above and cook for 20-25 minutes.